Maybe this is a trend, maybe this is a cool tool, maybe this is silly. It is Typealyzer, a website that can analyze the text of another website (which you identify) and gives you the personality of the target site in Myers-Briggs notation (MBTI). You know, the four letter extensions of inner directed/outer directed psychological traits popular with personality tests. What I had not realized is that there are groups, forums and websites dedicated to each of the 16 Myers-Briggs personality categories. A master list is here. For instance readers of the Technium (and probably its author!) 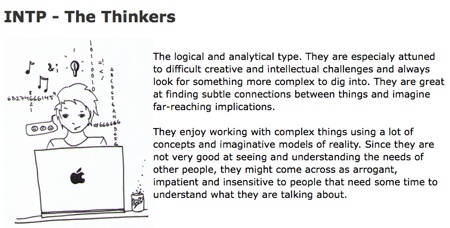 should be reading INTP.org.